Grilled lettuces — No, seriously. Radicchio is fairly bitter, and what do I always say to do to tame bitter veggies? Cook ’em! This recipe is fast and awesome. One thing though — make grilled lettuces to order. They do not reheat well. Crockpot pot roast braised with onions, carrots, chopped broccoli greens, and potatoes — I’ll be adding the veggies to this recipe. Nothing like coming home from work to a house that smells like heaven, thanks to dinner cooking unattended while you were out. Vanilla-poached peaches — Depending on how many peaches we get, I’ll probably make this minty bulgur wheat and peach salad, too. Grilled corn with mango-habanero butter — I tend to prefer mango as an accompaniment rather than the star of the meal, but if you love mango, this mango pie with crystallized ginger is fantastic. This recipe should help your weeknight dinners come together quickly. 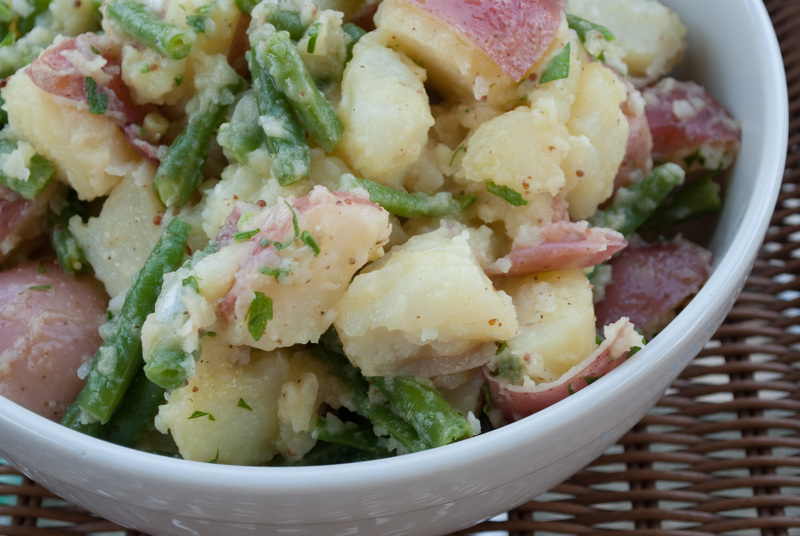 Some foods just lend themselves to fast preparation, and green beans are one of them. This stir-fry only has six ingredients, plus some water, and cooks in less than 10 minutes. It’s also really tasty. 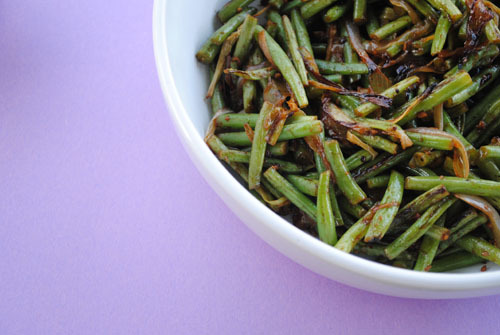 I used some of the baby onions and leeks we’ve gotten recently in place of the 1/2 onion in the original recipe, and the oyster sauce adds some salty depth to the beans’ flavor. If you don’t have it, just season with soy sauce at the end instead. Be sure to have all of your ingredients prepped and ready to go when you start cooking. 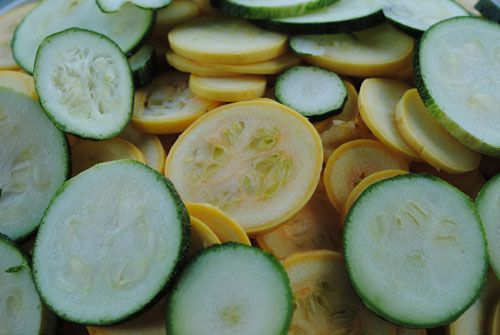 I knew I’d be making this recipe as soon as I saw the bounty of squash we received in our last box. It’s one of my favorites, and I’ve made a few modifications to incorporate more Local Box ingredients. 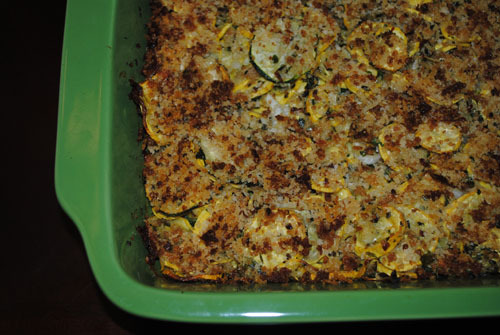 Fresh squash and baby onions mix with an oregano-parsley pesto, cheese, and brown-butter breadcrumbs to make a dish that’s fresh and decadent. Yum. Kebabs with chicken, onions, and summer squash — Alternate chunks of chicken, onion, and squash on skewers. Brush with olive oil and grill 7-8 minutes, turning once, until chicken is done and veggies are tender. Sprinkle with chopped parsley. You can use curly parsley just as you would flat-leaf (Italian) parsley — flat-leave just has a bit more flavor. 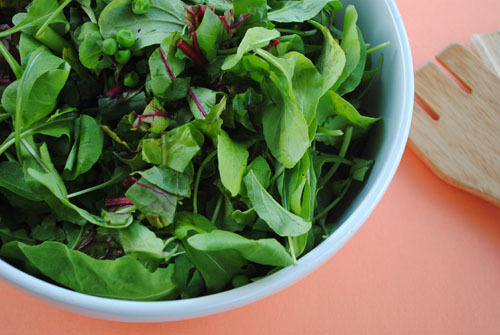 Greens and beans soup — Use collards and beet greens here. Kohlrabi puree — Or try one of these kohlrabi recipes. Borscht — I’ve never tried this before, but this recipe, involving a beef shank, looks delicious.